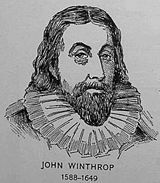 John Winthrop (January 12, 1588 – March 26, 1649) led a group of English Puritans to the New World, joined the Massachusetts Bay Colony in 1629 and was elected their first governor on April 8, 1630. As governor of the Colony, he established the center of government at Boston. In his famous sermon, A Modell of Christian Charity, (1630), when Winthrop said: "...for we must consider that we shall be as a city upon a hill, the eyes of all people are upon us...," he urged his listeners to have a standard that shines out for others to notice. In this sermon, he declared that the Puritan colonists emigrating to the New World were part of a special pact with God to create a holy community. This speech is often seen as a forerunner to the concept of American exceptionalism. The speech is also well known for arguing that the wealthy had a holy duty to look after the poor. The idea of restoration, of building an ideal society here on earth, emerged as a dominant theme in later American religious thought. President Ronald Reagan among others cited Winthrop as a source of inspiration. Winthrop has been described as America's "forgotten founding father." Winthrop was born in Groton, England, the son of Adam Winthrop (1548–1623) and his wife, Anne Browne. Winthrop briefly attended Trinity College, Cambridge, then studied law at Gray's Inn, and in the 1620s became a lawyer at the Court of Wards in London. Winthrop married his first wife, Mary Forth, on April 16, 1605 at Great Stambridge, Essex, England. She bore him six children and died in June 1615. He married his second wife, Thomasine Clopton, on December 6, 1615, at Groton, Suffolk, England. She died on December 8, 1616. On April 29, 1618, at Great Maplestead, Essex, England, Winthrop married his third wife, Margaret Tyndal, daughter of Sir John Tyndal and his wife Anna Egerton. Margaret Tyndall gave birth to six children in England before the family emigrated to New England (The Governor, three of his sons, and eight servants in 1630 on the Arbella, and his wife on the second voyage of the Lyon in 1631, leaving their small manor behind). One of their daughters died on the Lyon voyage. Two children were born to them in New England. Margaret died on June 14, 1647, in Boston, Massachusetts. Winthrop then married his fourth wife, Martha Rainsborough, widow of Thomas Coytmore, sometime after December 20, 1647, and before the birth of their only child in 1648. His son, John Winthrop, the Younger, whose mother was Mary Forth, later became Governor of Connecticut. Winthrop was extremely religious and subscribed fervently to the Puritan belief that the Anglican Church had to be cleansed of Catholic ritual. Winthrop was convinced that God would punish England for its heresy, and believed that English Puritans needed a shelter away from England where they could remain safe during the time of God's wrath. Other Puritans who believed likewise obtained a royal charter for the Massachusetts Bay Company. Charles I of the United Kingdom was apparently unaware that the colony was to be anything other than a commercial venture to America. However, on March 4, 1629, Winthrop signed the Cambridge Agreement with his wealthier Puritan friends, essentially pledging that they would embark on the next voyage and found a new Puritan colony in New England. The colony's land was taken from Native Americans with Winthrop's excuse that the natives hadn't "subdued" the land and thus had no "civil right" to it. Winthrop pledged 400 pounds to the cause and set sail on the ship the Arbella—named after the wife of Isaac Johnson, daughter of Thomas, 5th Earl of Lincoln. Winthrop befriended the younger Johnson in earlier days in England, spending many days at Isaac's family home. John Winthrop had been elected governor of the colony prior to departure in 1629, and he was re-elected many times. He was governor for twelve out of the 19 years he lived in Massachusetts. As governor he was one of the least radical of the Puritans, trying to keep the number of executions for heresy to a minimum and working to prevent the implementation of more conservative practices such as veiling women, which many Puritans supported. In the early 1630s, when Winthrop first arrived in New England, he led the colonists as they built tightly organized towns, each one having a strong church. Winthrop settled in the city of Boston that became the capital and chief port of Massachusetts. Winthrop received much opposition as dissidents challenged his system. Roger Williams criticized the church-state relations. He was disappointed when quite a few colonists migrated from Massachusetts to Connecticut. Like his Puritan brethren, Winthrop strove to establish a Christian community that held uniform doctrinal beliefs. It was for this reason that in 1638 he presided over the heresy trial and banishing of Anne Hutchinson from the colony. During this trial Winthrop referred to Hutchinson as an "American Jezebel." Winthrop also subscribed to the belief that the native peoples who lived in the hinterlands around the colony had been struck down by God, who sent disease among them because of their non-Christian beliefs: "But for the natives in these parts, God hath so pursued them, as for 300 miles space the greatest part of them are swept away by smallpox which still continues among them. So as God hath thereby cleared our title to this place, those who remain in these parts, being in all not 50, have put themselves under our protection." Winthrop is most famous for his "City Upon a Hill" sermon (as it is known popularly, its real title being A Model of Christian Charity), in which he declared that the Puritan colonists emigrating to the New World were part of a special pact with God to create a holy community. This speech is often seen as a forerunner to the concept of American exceptionalism. The speech is also well known for arguing that the wealthy had a holy duty to look after the poor. Recent history has shown, however, that the speech was not given much attention at the time of its delivery. Rather than coining these concepts, Winthrop was merely repeating what were widely held Puritan beliefs in his day. Ronald Reagan among others has cited Winthrop as a source of inspiration. However, those who praise Winthrop fail to note his strident anti-democratic political tendencies. Winthrop stated, for example, "If we should change from a mixed aristocracy to mere democracy, first we should have no warrant in scripture for it: for there was no such government in Israel...A democracy is, amongst civil nations, accounted the meanest and worst of all forms of government. [To allow it would be] a manifest breach of the Fifth Commandment." The Town of Winthrop, Massachusetts, is named after him, as is Winthrop House at Harvard University, though the house is also named for the John Winthrop who briefly served as President of Harvard. ↑ John Winthrop; A Modell of Christian Charity (1630) Retrieved January 21, 2008. ↑ Francis J. Bremer, John Winthrop: America's Forgotten Founding Father (Oxford: Oxford University Press, 2003. ISBN 0195149130), p. 299. ↑ The Myth of Thanksgiving Retrieved January 21, 2008. ↑ R.C. Winthrop, Life and Letters of John Winthrop (Boston, 1869), vol. ii. (Michigan Historical Reprint Series ISBN 1425556450), p. 430. Meacham, Jon. American Gospel God, the Founding Fathers, and the Making of a Nation. New York: Random House, 2006. This page was last modified on 23 May 2018, at 15:59.